Anyone who thinks our toxic financial system is stable is delusional. Why are we doomed? Those consuming over-amped "news" feeds may be tempted to answer the culture wars, nuclear war with North Korea or the Trump Presidency. 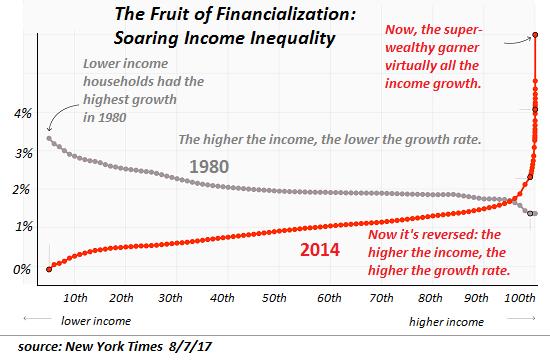 The one guaranteed source of doom is our broken financial system, which is visible in this chart of income inequality from the New York Times: Our Broken Economy, in One Simple Chart. While the essay's title is our broken economy, the source of this toxic concentration of income, wealth and power in the top 1/10th of 1% is more specifically our broken financial system. What few observers understand is rapidly accelerating inequality is the only possible output of a fully financialized economy. Various do-gooders on the left and right propose schemes to cap this extraordinary rise in the concentration of income, wealth and power, for example, increasing taxes on the super-rich and lowering taxes on the working poor and middle class, but these are band-aids applied to a metastasizing tumor: financialization, which commoditizes labor, goods, services and financial instruments and funnels the income and wealth to the very apex of the wealth-power pyramid. Take a moment to ponder what this chart is telling us about our financial system and economy. 35+ years ago, lower income households enjoyed the highest rates of income growth; the higher the income, the lower the rate of income growth. This trend hasn't just reversed; virtually all the income gains are now concentrated in the top 1/100th of 1%, which has pulled away from the top 1%, the top 5% and the top 10%, as well as from the bottom 90%. The fundamental driver of this profoundly destabilizing dynamic is the disconnect of finance from the real-world economy. The roots of this disconnect are debt: when we borrow from future earnings and energy production to fund consumption today, we are using finance to ramp up our consumption of real-world goods and services. In small doses, this use of finance to increase consumption of real-world goods and services is beneficial: economies with access to credit can rapidly boost expansion in ways that economies with little credit cannot. But the process of financialization is not benign. Financialization turns evertything into a commodity that can be traded and leveraged as a financial entity that is no longer firmly connected to the real world. The process of financialization requires expertise in the financial game, and it places a premium on immense flows of capital and opaque processes: for example, the bundling of debt such as mortgages or student loans into instruments that can be sold and traded. These instruments can then become the foundation of an entirely new layer of instruments that can be sold and traded. This pyramiding of debt-based "assets" spreads risk throughout the economy while aggregating the gains into the hands of the very few with access to the capital and expertise needed to pass the risk and assets off onto others while keeping the gains. Profit flows to what's scarce, and in a financialized economy, goods and services have become commodities, i.e. they are rarely scarce, because somewhere in the global economy new supplies can be brought online. What's scarce in a financialized economy is specialized knowledge of financial games such as tax avoidance, arbitrage, packaging collateralized debt obligations and so on. Though the billionaires who have actually launched real-world businesses get the media attention--Bill Gates, Jeff Bezos, Steve Jobs, et al.--relatively few of the top 1/10th of 1% actually created a real-world business; most are owners of capital with annual incomes of $10 million to $100 million that are finance-generated. This is only possible in a financialized economy in which finance has become increasingly detached from the real-world economy. Those with the capital and skills to reap billions in profits from servicing and packaging student loan debt have no interest in whether the education being purchased with the loans has any utility to the indebted students, as their profits flow not from the real world but from the debt itself. This is how we've ended up with an economy characterized by profound dysfunction in the real world of higher education, healthcare, etc., and immense fortunes being earned by a few at the top of the pyramid from the financialized games that have little to no connection to the real-world economy. Anyone who thinks our toxic financial system is stable is delusional. If history is any guide (and recall that Human Nature hasn't changed in the 5,000 uears of recorded history), this sort of accelerating income/wealth/ power inequality is profoundly destabilizing--economically, politically and socially. All the domestic headline crises--culture wars, opioid epidemic, etc.--are not causes of discord: they are symptoms of the inevitable consequences of a toxic financial system that has broken our economy, our system of governance and our society. Thank you, Steve S. ($50), for your massively generous contribution to this site -- I am greatly honored by your steadfast support and readership.